2 What causes a flea infestation? Need some rabbit flea treatment? This article explores how to remove fleas and which products you need to get the job done. Fleas are a parasite that are often associated most commonly with cats and dogs. Unfortunately for us rabbit owners, Rabbit fleas also infest our beloved bunnies. Due to the minuscule size of fleas, they’re very difficult for rabbit owners to see with the naked eye. Fleas will feed off the blood of your rabbit, which is a very unpleasant thought as an owner.Many people consider fleas harmless however, they can cause serious conditions such as myxomatosis and anaemia. So, it’s important to get your rabbits fleas treated as quickly as possible. If your rabbit has got fleas it’s important you have the best tools on hand for treating the fleas. You’ll need a good quality pH balanced shampoo for washing the fleas out. A small animals flea comb with fine teeth in order to comb the fleas out effectively. We also recommend an adequately sized wash basin in order to wash your bunny in. Below is a list of the best products to help you with flea treatment for rabbits. What we love about this flea shampoo is it’s completely tearless and pH balanced making it safe for your pet. It’s always important to be cautious of products you’re putting on your pets. Knowing this one is safe gives you real peace of mind. This helps eliminate odors due to the baby powderfragrance which lasts a long time. 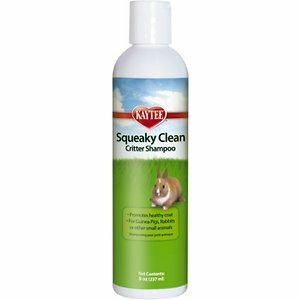 This leaves your rabbits coat feeling softer, smelling fresher and leaves it shiny and sqeaky clean. If you have multiple pets this is great news. This is because you aren’t just limited to using it on your rabbit. You can also use it on other small animals such as guina pigs. This comes in an 8 ounce bottle. We love this flea comb. This is due to the fact that it’s made from very fine teeth. These are flexible in order to help remove all kinds of fleas and ticks. This can also be used even after the fleas are gone in order to remove dandruff. This comes with an ergonomic handle and is equipped with good quality pins. Something we also love about this product is that the manufacturer donate profits to rescue societies. Any product you buy from this manufacturer means they will donate 15% of the profit to the American Animal Rescue Society. This is a nice touch and gives you a chance to do something good while getting rid of your rabbits fleas. Win win! Last but not least on this list are these great wash basins. You might have some of these lying around the house. However, we personal find it’s easier to buy something purpose bought for washing your rabbit. This prevents you from using a basin which has had any potentially harmful chemicals used on them. This wash basin is spacious enough for two large human feet so there’s plenty of room for your bunny. It comes in a pack of two which is great. This means you can sit your bunny in one while you wash its hair. Use the other basin to wash out the fleas you scoop up so they’re kept away from your rabbits clean fur. Fleas spread most quickly by being passed from animal to animal. So, if your rabbit lives with other animals it’s very possible fleas can be transferred from one of your pets to another. Fleas are most active in the spring time which is generally when they tend to lay eggs. However, infestations are not limited to this time of year and it’s important for rabbit owners to be cautious during every season. The classic symptom of fleas is of course itching. This is caused by flea bites which are unbearably itchy for your rabbit. If you’ve noticed your rabbit itching a lot, then this is the biggest warning signal. You might actually notice the fleas when brushing your rabbit. You may find that your rabbit chooses to bite the itch rather than scratch it with it paws. In this instance there’s potential that your rabbit will bite so frequently that fur gets removed. If you notice that your rabbit has bald patches this is another sign your rabbit has fleas. Other symptoms include very dry patches of skin and very frequent licking. If you have any suspicions that your rabbit has fleas be sure to consult your vet as quickly as possible. It’s definitely much easier to put measures in place to prevent fleas, than it is to remove a full infestation after it’s occurred. It’s important that your rabbit is regularly gloomed, and kept in as clean an environment as possible. We also recommend that if any of your other pets develop a flea infestation, you implement a strict quarantine procedure to ensure that fleas and passed to your other pets. If there are very few fleas present on your rabbit, it’s likely that a good flea comb will do well in removing these. You can use the flea comb along with some water to slowly remove the fleas. Make sure that the comb is washed between each application. We recommend storing the fleas in a separate basin to the one you’re washing your bunny in. It’s important to note that there may be other reasons for your rabbits symptoms. In fact, it may be parasites such as ticks or mites. This is why it’s important you don’t self diagnose the issue and consult your vet if your are worried. Your vet is likely to run various tests to ensure that your rabbit definitely has fleas as you suspect. If this is the case, further checks are likely to be run to ensure the flea infestation hasn’t amounted to a worsened condition. Your vet should take samples of your rabbits blood to ensure that it hasn’t developed conditions such as anaemia. Rabbit fleas, although most of the time harmless can present serious issues in the worst case if they are left untreated. So, it’s important that you get them removed as quickly as you can. As we mentioned earlier, it’s easier to prevent rabbit fleas than it is to remove a flea infestation. If you’re suspicious your rabbit does have fleas be sure to consult a vet for an expert opinion.